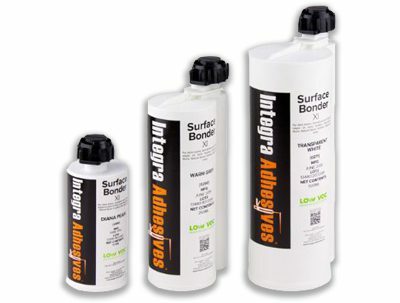 Integra Adhesives Surface Bonder Xi (250 ml) is the latest generation of adhesive for the surfacing industry. As an easy-to-apply surface bonder, it can be used on ALL surfaces – Quartz, Granite, Ceramics, Glass, Concrete, etc. This bonder is specifically developed for fabrication methods such as laminating, mitering, v-grooving, integral mounted sinks and bowls, and applications subject to dynamic loads. Additionally, Surface Bonder Xi is a semi-automated mix and dispenser system. It’s composition includes a dual component cartridge, static mixer, and a hand-held dispenser. Comes with (2) 250 ml Mixing Tips.